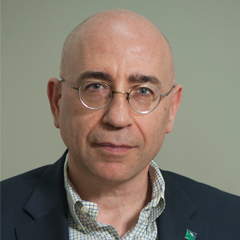 Dr. Mazen Y. Kanj is a Petroleum Engineering Consultant at Saudi Aramco and Director of the Center for Integrative Petroleum Research (CIPR) at the newly founded College of Petroleum Engineering & Geosciences (CPG) at KFUPM. He is a founding member and team lead for the In-Situ Sensing and Intervention (ISSI) focus area of the Reservoir Engineering Technology Division of EXPEC ARC. He developed the concept of Resbots for reservoir use an application to solve the challenges in formation evaluation, reservoir monitoring, and enhanced recovery. He further coined the concept of reservoir nanoagents (Resbots) and developed the reservoir nanoagents suite with two successful nanoparticle field demonstrations for the company. Dr. Kanj has close to 24 years of industry and academic research experience outside his graduate study, 13 of which are with Saudi Aramco. Ph.D., Civil Engineering, the University of Oklahoma, USA, 1995. ME, Civil Engineering (Structural Engineering), the American University, Beirut, Lebanon, 1990. BE, Civil Engineering, Beirut, Lebanon, 1988. Chuang Y-J, Liu F, Wang W, Kanj MY, Poitzsch ME, and Pan Z., “Ultra-sensitive in-situ detection of near-infrared persistent luminescent tracer nanoagents in crude oil-water mixtures”, Scientific Reports. 2016; 6:27993. doi:10.1038/srep27993. Kanj, M.Y. and Abousleiman, Y., “Taming Complexities of Coupled-Geomechanics in Rock Testing: From Assessing Reservoir Compaction to Analyzing Stability of Expandable Sand Screens and Solid Tubulars”, SPE Journal, Sep. 2007, v. 12, No. 3, pp. 293-303. Featured article in SPE JPT “Illuminating Saudi Reservoirs.” Jun. 2012. EXPEC ARC Milestone Award Saudi Aramco 2010. Service Award SPE Associate Editor of the Editorial Review Committee; SPE Journal, 2009. 2008 World Oil New Horizons Idea Award for the Reservoir Nanoagent (Resbots) concept.